Sweetriot is chocolate-covered cacao nibs. Some of you might be asking “What are cacao nibs”? If you are, and you’re interested in how chocolate is made, visit this post and watch the video. It’s interesting stuff. Essentially, cacao nibs are the centers of the cacao beans after they have been washed, roasted, and de-hulled. At this stage they are roughly halfway through the chocolate-making process. 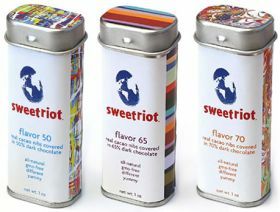 Sweetriot takes these nibs and coats them in chocolate – 50% dark chocolate in the Flavor 50, 65% dark chocolate in the Flavor 65, and 70% dark chocolate with a hint of espresso in the Flavor 70. The look of the candy itself reminds me of chocolate-covered raisins, only a bit smaller. Each one is a unique shape depending on the size and shape of the nib underneath. Eating them reminded me very much of eating chocolate-covered espresso beans. The nibs themselves are crunchy and the chocolate coating them is excellent. The Flavor 50 is nicely sweet and very chocolatey. It almost has an Amaretto taste which is very nice. The Flavor 65 has a flavorful bittersweet chocolate taste and is very different from the Flavor 50 because it’s noticeably less sweet. The Flavor 70 is a really rich dark chocolate and the hint of espresso is a nice touch (assuming you like the taste of espresso). Sweetriot is also all-natural, dairy-free, gmo-free, kosher, gluten-free and is the best candy I have had in quite a while – it is really good stuff. All three varieties are fan-freakin-tastic. I really want to down a whole tin at one sitting, but I have been restraining myself and just having a few here and there for the past few days so they will last. Now the bad news: the sweetriot tins are about $5 each. Pretty pricey, but well worth it for someone that truly appreciates good chocolate. You can purchase sweetriot online at their site or you can check their store locator to see if there is a retailer near you. UPDATE: Sweetriot is not certified vegan. I have updated the review above to reflect this. The tins are extremely cute, they remind me of the ones for the BAWLS “mints”, I’m guessing they’re about the same size (like a disposable lighter)? At that price you should be getting a lot more, and I thought the Scharffen Berger ones were expensive at $8 for 4.5 ounces! If they’re anything like those, they really are addictive. Mmmmm. LoveLeaf Garden has really good cacao from peru.